The Seymour Public Library District traces its history back to 1876, when the Seymour Library Association was established in May. The previous year, James Skinner Seymour, president of the National Bank of Auburn, bequeathed $18, 000 for a library. During its first years, the library was not open free of charge, but had an annual membership fee of $2 to defray operating costs which lasted until 1896. The original library was located on the second floor of the Auburn Savings Bank building (now known as the Phoenix Building). 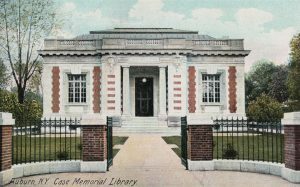 In March of 1896, Willard E. Case approached library trustees and offered to purchase land and build a new home for Seymour Library, provided that the building be known as the Case Memorial in memory of his parents, and that the library cease charging for membership. The offer was gladly accepted. April 1, 1896, Auburn had a free public library and received its official certification from the University of New York on May 5th. In 1901, work began on the Case Memorial. A contest to choose a design for the building was conducted, and the New York City firm of Carrere and Hastings was selected as architects. The firm later would design the New York Public Library. The structure is an example of the Beaux Arts School of Architecture and is built of brick and limestone. It was completed after two years and much of the interior carving and woodwork was done by European craftsmen who were still hard at work when the library opened in 1903. 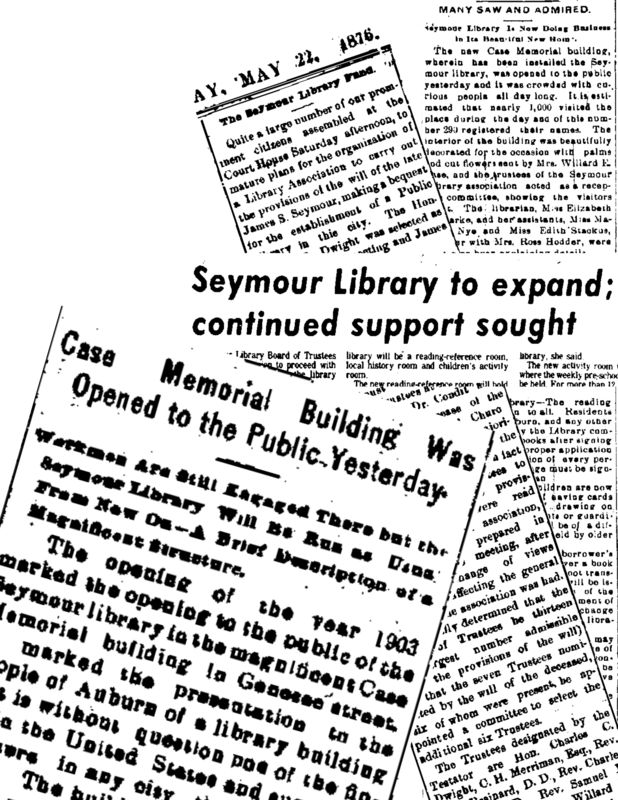 Willard Case deeded the property to the Seymour Library Association in March 1904. Few changes were made to the building until the fall of 1972, when the ground was broken on an expansion project that added 40% more space to the building. A second building project in 1993 enlarged the overall size of the Case Memorial to 19,400 square feet, and provided a new entrance with easier access, an elevator and security system. All capital expenditures have been financed by private donations. The Case Memorial Building is the property of the Seymour Library Foundation, Inc., and is leased at no cost for use by the Seymour Public Library District. Since 1980, the Library has been listed on the National Register of Historic Places. In October 1992, registered voters in the City of Auburn and the Town of Owasco voted to participate in a special district and provide property taxes in support of a public library. Consequently, the Seymour Public Library District was created on January 1, 1993, with an elected board of trustees, and the Seymour Library Association ceased operation. A new charter was granted by the New York State Department of Education. In October 1995, registered voters in the portion of the town of Sennett within the Auburn Enlarged City School District voted to join the special district. In October 2010, registered voters in the portion of the town of Fleming within the Auburn school district voted to join the special district.